What to give the teacher for Christmas? is the question on many parents’ minds this time of year. In an effort to avoid the usual trap of candles and bath products, I read various blogs and searched Pinterest for ideas. 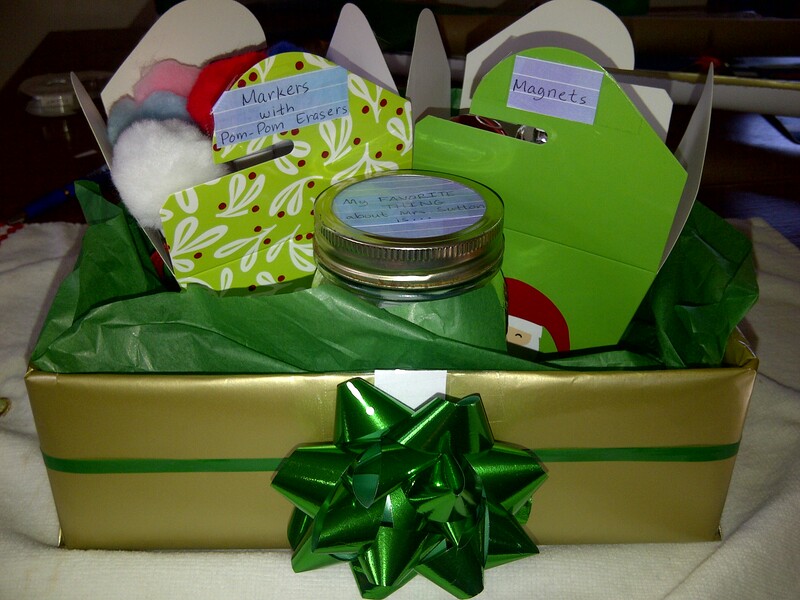 I ended up making a gift box with several items. This probably cost me less than $10. This was the least expensive (free, really) gift and also took the most effort. My son helped me make a list of all the kids in his class. 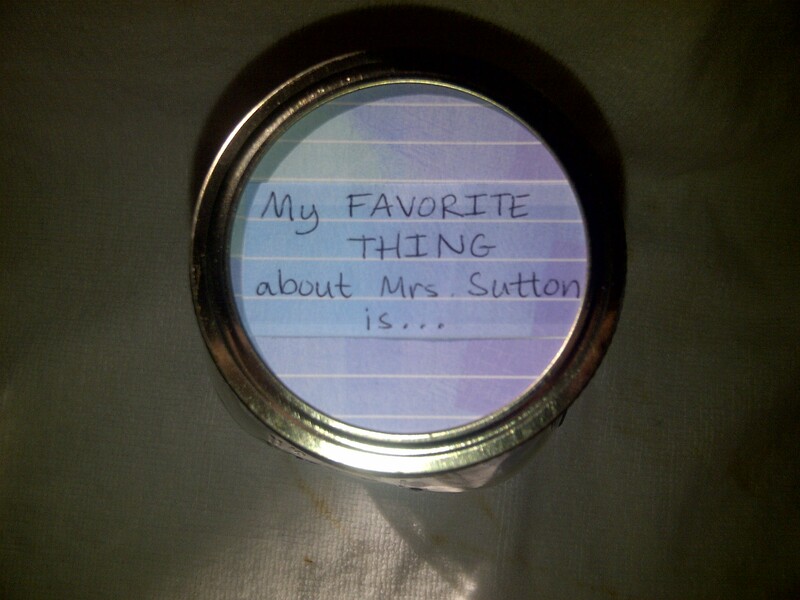 I then went around asking the students, “What’s your favorite thing about Mrs. Sutton?” Collecting the responses was somewhat time-consuming. I emailed the parents who were in my address book; I took my list with me when I volunteered in the classroom, but the tricky part about this option was getting their answers written down without having Mrs. Sutton noticing! I also took my list to a class birthday party and I waylaid some of the walkers after school. I managed to get replies from most of the children in the class. Some of them gave challenging answers – one kid said “eyeball” and another kid kept saying “I don’t know.” I wrote them all down, figuring that Mrs. Sutton knows their personalities and would appreciate even the unusual responses. Once I collected their answers, I wrote them on slips of paper and placed them in a Mason jar. 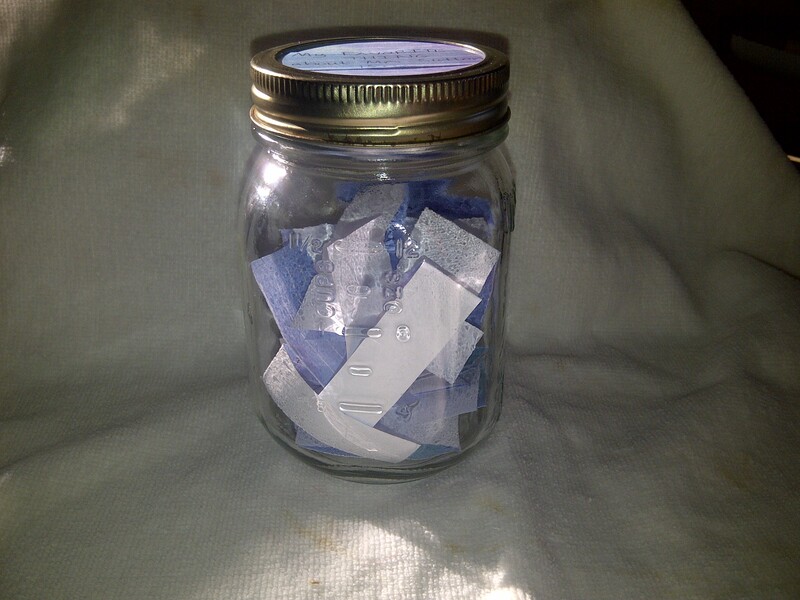 Using the same type of paper, I traced the lid and cut out a circle to label the top of the jar. 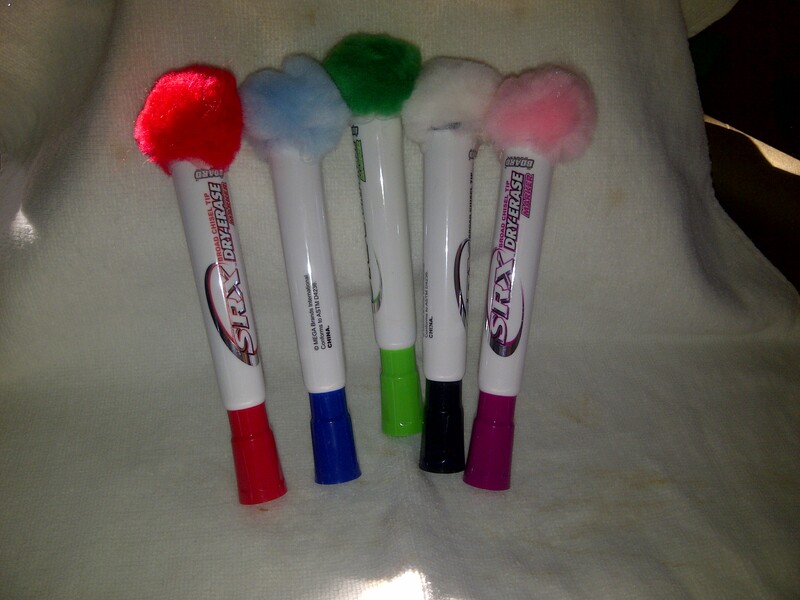 I purchased a set of dry erase markers and a bag of large, colorful pom-poms at Michael’s. 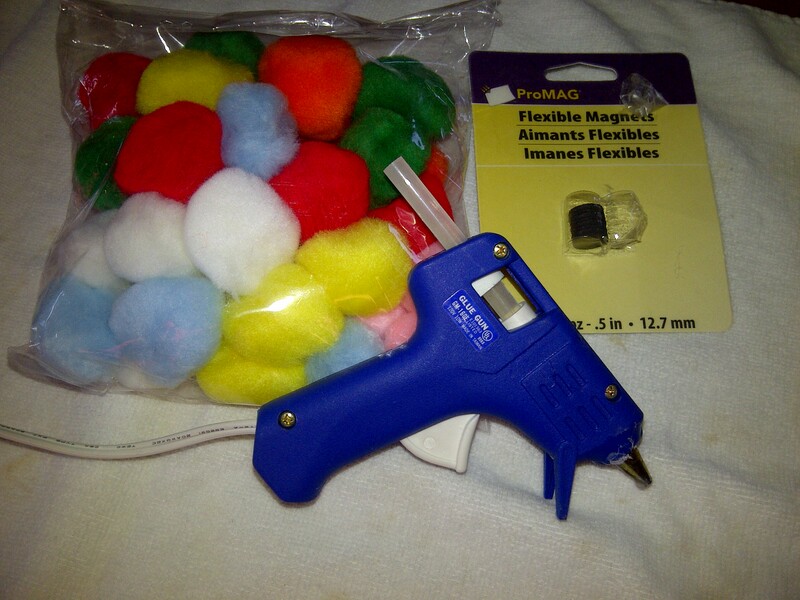 I used a hot glue gun to attach pom-poms to the ends of each marker, using corresponding colors as much as possible. The pom-poms become erasers. I hope they will be useful in the classroom or at home. 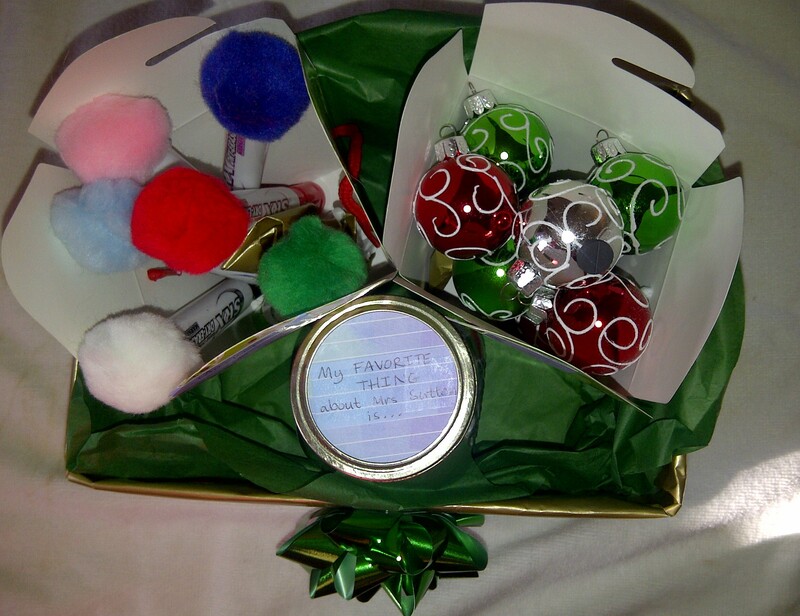 And, I probably have enough pom-poms left over to give this gift to every teacher until my son finishes elementary school! 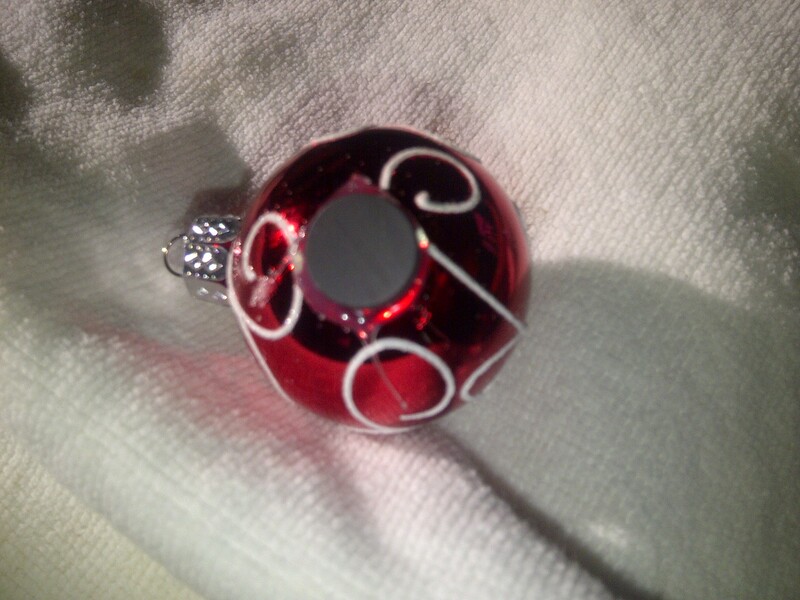 I think this is the prettiest gift of the three. 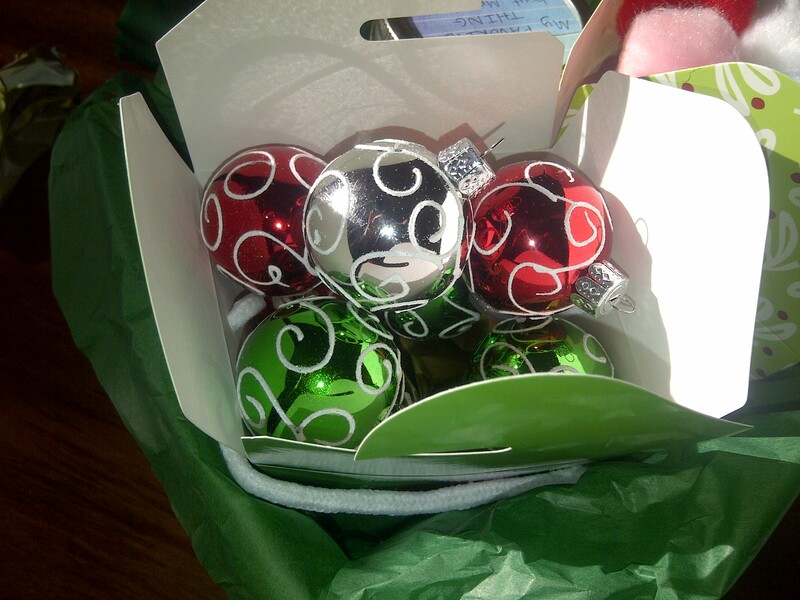 I bought a packet of magnets at Michael’s and a set of 8 small, round ornaments (golf-ball size). A bit of hot glue and affixing the magnet to the ornament, and now Mrs. Sutton can have a little festive cheer on any magnetic surface she chooses! To wrap, I cut the top flaps off an Amazon box and wrapped it in a neutral-colored paper. A little ribbon, a bow, and some treat boxes purchased at Target gave it a nicely finished look. I will slip in a homemade card from my 6-year-old and we’ll be ready to deliver. So much fun!